I previously tried a powdered laundry soap recipe, and concluded that it was too much effort and not worth the trouble for the minor cost-savings. As a footnote to that post, I mentioned a different, liquid recipe that looked promising. When the homemade powder ran out, I decided to try that liquid recipe. Now that we’ve been using it at home for a few weeks, I’ve concluded that it’s great! Grate bar of soap and add to saucepan with water. Stir continually over medium-low heat until soap dissolves. Fill 5 gallon bucket half full of hot tap water. Add melted soap, washing soda and Borax. Stir well until all powder is dissolved. Next morning, stir well. 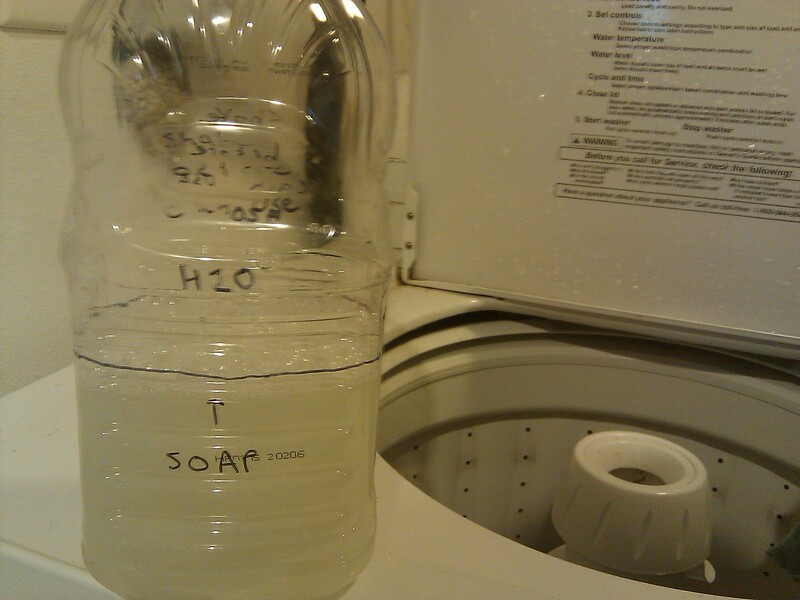 Fill a laundry soap dispenser half full with soap and then fill rest of way with water. Shake before each use, as the mixture will gel. Use ¼ c per load in a front-load/HE washer or ½ c in a top-load/conventional washer. The recipe yields 320 washes for top-load and 640 washes for front-load, so you might want to half (or even quarter) it as a trial run the first time. The ingredients cost about $6 total, so that’s less than $0.02 per load. We used to use Trader Joe’s powder detergent which is $0.16 per load. We do about 200 loads of laundry a year and I estimate the recipe took about 30 minutes of my time, so I’m saving about $28 for a half-hour’s worth of work, or $56 an hour (more than I make at work). Plus, I know exactly what’s in the detergent and that all ingredients are safe, which is a plus. In conclusion: totally worth it! * To make washing soda out of baking soda, bake it for an hour at 400 degrees. Update: This batch of laundry detergent lasted exactly one year for our family of 5. Previous PostGallon Challenge: All Used UpNext PostHang Dry Your Laundry: Just Do It!